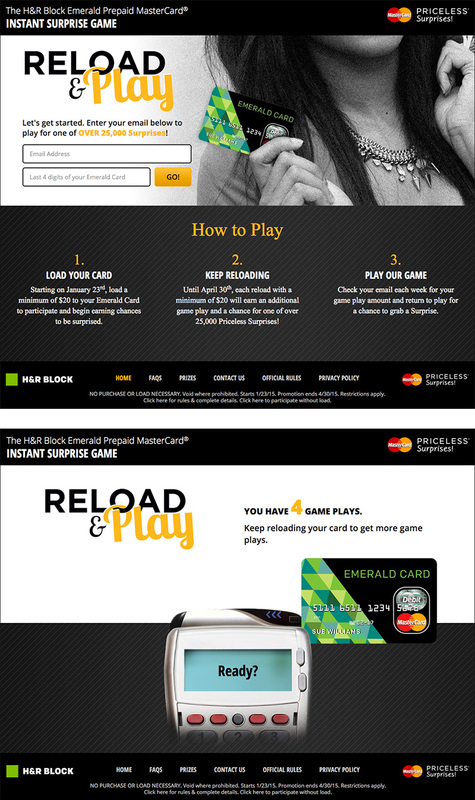 MasterCard Reload & Play is an Instant Surprise Game which rewards debit card holders with contest entries each time they add funds to their accounts. Card holders enter their email address and last-four digits of their debit card to redeem contest entries. Cash prizes are awarded daily to thousands of lucky winners! Team Digital contracted Pomp Productions to develop and build a modular contest platform which can be used across multiple campaigns for card issuers such as H&R Block and Go Bank. The platform includes a custom content management system which automates data imports provided by MasterCard. The CMS features real-time reporting of entry and prize details. The platform features a mobile responsive theme which can be easily re-skinned with new MasterCard branded debit cards.